Whoa crazy crazy. After two weeks in the weeds discussing possible major changes to Wizards’ approach to Modern, it’s high time for nice, wholesome event analysis, and what a weekend for it. Two Grand Prix in Birmingham and São Paulo, a Modern Open and a Modern Classic in Richmond, not to mention two weeks of online events are at our fingertips, and I don’t even know where to start. Burn, BG Rock, Bant Knightfall, and Titan Shift are the hot decks this weekend. This isn’t 5-0 flash-in-the-pan results. These are the finals archetypes of our two Grand Prix. Let’s figure out what the hell happened. As we’ll have our hands full digging into the surprising results from the two Grand Prix, I’ll be focusing my attention exclusively on those two events. It might seem weird to overlook the SCG Open and Classic, but I’ve got bigger fish to fry here. Just keep in mind that those events also happened, and the results were more…shall I say…usual. As we’re about to descend into the world of insanity, a little perspective will serve us well. That being said, let’s start at the top. Before diving into the lists, let’s grab some immediate takeaways from the archetype representation. This will do a few things for us, primary among them craft a narrative about the event that we can then investigate once we look into the decklists. For example, what should be immediately apparent is the lack of just about any Tier 1 archetype presence in the Top 8 of GP Birmingham, minus the lone Shadow deck, of course. No Eldrazi Tron, no Affinity, and only one Grixis list. That’s a pretty big deal, and immediately suggests a field hateful to the top decks. This isn’t groundbreaking, by any means, as most events are filled with players prepared to beat the top decks in the field. Usually, it’s the second level that influences whether the top decks, or the decks tweaked to beat the top decks, come out on top. In most cases, whether the “meta decks” beat up on the top decks depends almost entirely on the success or failure of the “format police,” the stress-test deck that holds all of the random archetypes under the surface. In Modern, that title is usually held by Burn, Affinity, and Eldrazi Tron. Go too far down the rabbit hole (like by playing Rise // Fall or Monastery Mentor instead of generally powerful cards) and decks like these will punish you for your decisions. Affinity and Eldrazi Tron double as stress-test decks that also happen to be two of the best decks in the field—so, in theory, a meta deck that is able to fight these two strategies should do well. This reasoning suggests why we see Burn on top, and neither Affinity nor Eldrazi Tron anywhere in the Top 8. Rogue strategies like Bant Humans and Lantern Control appear to be precursors to an Affinity-less/Bant Eldrazi-less Top 8. They also fit into the narrative that these meta decks fell short of the other format stress test, Burn (which took down the whole event). Burn winning an event always comes with a sort of “shrug, yeah that makes sense I guess” reaction, as everyone knows Burn is capable of taking an event by surprise, but players tend to focus on the more unique matchups. Now that we have an idea of what happened, let’s dig into the lists to see if we can find any information that supports (or invalidates) our theory. Another strong finish from BG Rock takes me back to Sol Malka’s finish at SCG Atlanta—you know, the thirteen-singleton sideboard special. Steve Hatto is a little more reserved here, maxing out on Fulminator Mage and devoting five cards to fight graveyard strategies. The bias against graveyard and big-mana decks is reinforced by Scavenging Ooze in the maindeck and three Ghost Quarter to go along with the sideboard Ramunap Excavator. Ditching red only really costs us Lightning Bolt and Kolaghan’s Command, and in exchange we get super smooth mana and some extra life. BG Rock is similar to Jund in that we can build it to beat just about anything, and it doesn’t have many natural enemies besides big control (which is kept down by everything else) and big mana. If you are ever curious about the expected meta for an event, the first place you should always look is the highest-performing midrange strategy. In this case, we only had to go to second place, which is a good sign that Steve hit the nail on the head. I’m highlighting Counters Company here not because I see anything especially unique with the decklist, but rather because its position in the Top 4 says enough. Counters Company is relatively straightforward: Lightning Bolt goes down, and its value goes up. Looking at the rest of the Top 8 (and specifically the Abzan and BG decks in the Top 4) suggests to me that most players chose to trim cheap removal and focus instead on attacking the format in unique ways. If this continues, expect Counters Company to continue putting up results. Finally, a Burn list we can actually showcase! Cutting Eidolon of the Great Revel for Shrine of Burning Rage is surprising, and definitely catches my attention. Eidolon of the Great Revel is solid, relatively guaranteed damage, but against a format caught unawares, Shrine of Burning Rage is absolutely insane. Grixis Death’s Shadow’s primary plan against Burn is damage control backed up by a quick clock, and Shrine of Burning Rage can grow to five counters or more relatively quickly. Once it’s down (which is usually on turn two), Stubborn Denial is no longer relevant, meaning Shrine can sit and build up damage until the last moment, when it gets fired off as an uncounterable kill spell. Kolaghan’s Command is a weakness, for sure, but Loïc Le Briand managed to capitalize on a correct assumption Jund players would leave the R part of their decks at home. Yes, in the maindeck they have Abrupt Decay and Maelstrom Pulse, but post-board the BGx players need to decide whether it’s smart to leave in expensive removal against a deck with only twelve permanents. Shrine could even come out! Switching gears, the story of Grand Prix São Paulo is relatively similar. No Affinity or Eldrazi Tron in the Top 8, and only two Death’s Shadow decks making the cut. Instead, Bant Knightfall wins the Grand Prix, beating Titan Shift to get there! This is a finish long in the making, as Knightfall had yet to see that definitive finish to put it into the conversation of high-tiered decks we expect to see win an event. A GP Top 8 here and there for a couple years is nice enough pedigree, but the archetype has been in need of a win to give it that final push. The maindeck is business as usual for the most part, with a good mix of three-drop value creatures and tempo options to pull everything together. Spell Queller has always been an integral part of this archetype, giving us the ability to react against just about anything while presenting an evasive clock and making the math hard for our opponent. In the sideboard, three copies each of Ceremonious Rejection, Mirran Crusader, and Flashfreeze make it very clear who João was targeting going into the event. If there ever was a weekend for Knightfall to take down an event, it would be this one. Where the story of Birmingham was Burn as the last stress-test left standing, here, Knightfall was able to fight through (or dodge) all the archetypes that have kept it down for so long. It’s not so much stars aligning as it is “right deck for the right weekend,” and I appreciate seeing a deck that on a normal day falls short finally getting one for the home team. Those three Flashfreeze in the Knightfall board were instrumental in pushing João over Titan Shift in the finals to grab the trophy. Three Flashfreeze and four Spell Queller is bad news for a deck as singularly focused as Titan Shift, but looking past that, Vitor Grassato’s list was great for the weekend. A focused and linear maindeck, baked up by game against fast aggro, problematic permanents, and graveyard strategies, is a formula for success, and one that is common in nearly every archetype in Modern. So, why Titan Shift, and why this weekend? Hour of Promise doesn’t make Zombies for us, unfortunately, but not having to get basic lands makes it better than Explosive Vegetation at least. The ability to tutor up two Valakut, the Molten Pinnacle and then just make land drops as usual for six damage a pop gives a lot of longevity to the strategy, and helps Titan Shift in those control matchups where blue hopes to hide behind a wall of counterspells (assuming we can resolve the Hour, of course). That being said, I wonder if Explosive Vegetation on turn three to set up a turn-four Scapeshift is just better, but I’ll defer to Vitor and players with more experience than I. Wood Elves as the fifth Sakura-Tribe Elder is cute too, but, as always, Titan Shift owes its success to the metagame just as much as its own deck composition. Eldrazi Tron, Affinity, and basically any other unfair thing can give it a lot of trouble, as doing essentially nothing of impact before turn four can be problematic. That’s always been the problem with the archetype, and it’s no big secret. A little luck and the right metagame, combined with the right list, all together leads to a solid performance by Titan Shift. The story of both Grand Prix was a success for the little guy. Most of the format players seemed to take a day off en masse, but it wasn’t by choice. The field successfully targeted the format boogeymen, and kept them down into the later rounds of the events. Burn, BGx, Knightfall, and Titan Shift were the winners on the day, but how long can that be sustained? Will we see the Tier 1 decks reclaim the throne next week? Or are we looking at a new shift? Titan Shift is picking up steam online, and potentially deserves a place among the top tier in the format. Or will the format adjust and push it back out of the conversation? Let me know what you think below, and thanks for reading! This is the sort of “rotation” I would prefer to see than bans/unbans meant to drive interest – the ebb and flow of hate towards established decks. 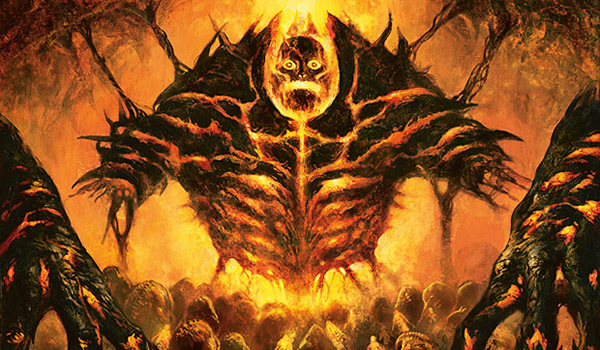 The main problem there is if some as of yet undiscovered build of grixis shadow, e-tron or affinity lets them push through hate to a greater extent. Great times to be playing modern. Certainly adds an extra layer of info to the full weekend when also including the Open and Classic, bumping the total decks represented by the weekend to 182.